I was born and raised in Wilkes-Barre. I always pictured myself teaching in the district that I was so lucky to be part of. It is a dream to be giving back to my community. I went to James M. Coughlin High School and then pursued my Bachelor's Degree at Wilkes University. I am in the process of applying for graduate school. My favorite thing about school is the students that I can share my classroom with. Even though I am their teacher, the students I have at GAR, always teach me things that help me become better not only professionally, but also outside of the classroom. I believe in being a life-long learner. My students certainly inspire me to look for "new ways" of teaching. Christopher Sedon always wanted to be a math teacher, even when he was in high school. Some of his mentors included Dave Lapinski and Ann Marie Macri. He is a CHS H.S. Honors graduate and earned his bachelor’s in mathematics and education. He began his teaching career at Wilkes-Barre Area in 2009. He is currently a senior high mathematics and computer science teacher at Meyers High School. His passion is computer programming. In 2012 and 2013 he traveled between Meyers and GAR to keep computer programming alive at both schools in the district. He has also written the curriculum for the computer programming track using the CSTA (Computer Science Teachers of America) national standards. In 2016-2017 he began teaching AP Computer Science A. He funded and designed the course on his own. Wilkes-Barre Area is one of the only school districts to offer AP Computer Science in the county. Christopher is also a member of the CTSA National Organization. Wilkes-Barre Area School District teachers, Brittany Scarnulis, Cecilia Baltusavich, Jennifer Ricci, and Mary Ann Rizzo make math fun and meaningful in the Junior High as they sponsor their students in Math Club each year. They encourage students to take math to a new level by involving them in the problem of the month, problem solving strategies, fun activities in regular math meetings and trips designed to show students the fun side of math that relates everything that we do to real life. We thank them for taking the extra time to inspire our students. 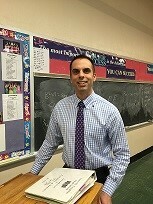 Coughlin Math teacher Gerald Gillis has been teaching AP Calculus for 8 years. Inspired by the early teachers of AP Calculus at Coughlin, he takes his teaching to new levels every year. Constantly refining and trying new strategies in the classroom has led him to author and present an online module for the College Board. This material entitled "Activity: Mean Value Theorem:Using graphic organizers to construct an argument" will be available for students across the country to use as they seek to understand the Mean Value Theorem. Mr. Gillis keeps sharp by working as a consultant for the College Board and attending numerous professional workshops geared to help bring his Coughlin students the most up to date material. Wilkes-Barre Area Math teachers were recently invited to participate in a “College Ready Summit” sponsored by the Pennsylvania Commission for Community Colleges. Wilkes-Barre Area has partnered with Luzerne County Community College for the third year in a row to offer a new math course geared to preparing students for the true college math experience. Being the only high school in Pennsylvania to partner with a community college, we were invited to speak about the “College Ready Math” course we have created and share how we best feel we can prepare students to transfer from high school to college. Since starting this course, two other local high schools are now using this model. Participating in the event from left to right are seated: Matthew Mill, Mackin High School math teacher, Lauren Wolfer, GAR High School Math Teacher, Jennifer Perks, Coughlin High School Math Teacher, Mary Krolewski, Meyers High School Math Teacher. Standing: Corinne Drost, Secondary Math Supervisor, Nicole Saporito, LCCC Math Department Chair.